Carefully choosing a domain name and a web hosting tends to be skipped by many small business owners just because they’ve put their focus on the current trends. If we look closely on how the most successful sites function these days, you’ll see that their foundation is well built before proceeding to external optimization methods. Three of the main factors that strengthen the foundation of SEO are the web hosting, the domain name, and the website itself. Carefully executing this part of the digital advertising process can offer heaps of advantages compared to those who don’t. With today’s competitiveness, we need to get as much advantage as we can. For one thing, your brand name must be consistent and brief. It must be able to clarify what the content on your site will be about. Additionally, it must be memorable to the users. Instead of choosing a brand name that’s difficult to pronounce or spell, go for the easy and catchy one because it is what your potential consumers will surely remember. This is also true for choosing a domain name. If the brand name and the domain name perfectly match, it’s easy for the online user to guess the site and find it immediately. It is a win on both ends. You’re probably not the first one to come up with a business name online because on the web, it seems like you can find anything. You can google your brand first and gather data that can help you easily rank. Google tools like the Diagnosis Tool can be used to determine a brand name’s ranking and uniqueness in a local area. Sites should not be your only priority too, let your research efforts reach most of the social media platforms to ensure that you will only compete with others based on sales and visibility, not based on using the same name. This kind of situation often ends in conflict which can possibly delay your business’ growth. Once you have settled with choosing a domain name, check for trademarks to discourage other SEOs in using it for their campaigns. If keyword stuffing doesn’t work in content creation, it is the same when it comes to creating a site name. Overusing keywords for the sake of ranking better is often considered as spam. And spammy sites don’t really get the best of results. Instead of stuffing your domain name with hyphens like car-rental-and-buying.com, go for the ones without hyphens (carrentalandbuying.com). There’s a reason the best sites don’t use this kind of technique when it comes to choosing a domain name. For one, it looks spammy and less professional. A TLD or a Top Level Domain is seen after your domain name. “.com” is an example, one that is commonly used, easy to create, and used by those who are commercially targeting consumers from all over the globe. Another TLD that you can be familiar with is “.co” – which we use here in lowcostseo – as it is meant for original businesses like ours. There are not much differences between .co and .com actually. It’s just that, .co, in today’s time, is more flexible and available to use compared to .com, where being unique is too much of a challenge. Other TLDs also exist and the common ones are “.net”, “.org”, and “.us”. Understanding what these common domain extensions are can help you decide the proper identity for your business. And since we are often providing our services to small businesses, we encourage you to opt with .co and .com because both are more recognized and are often used by people who are looking for services online. · 99% High Uptime – The worst thing that can possibly happen to a site is when it is at its season but the site is inaccessible. An hour of site inaccessibility is already equivalent to a lot of losses. Get involved with a web hosting that limits their downtime to keep your SEO strategies working. · Multiple Add-ons – Basic packages are present for those who prefer to keep it simple like for new businesses and sites. But as you go longer, having a lot of options is something you will really want. For example, automatic back-ups. You will need a backup for better or for worse to secure your site’s data. For an additional cost, some web hosting can already guarantee automatic back-ups. · Validation from Its Clients – These web hosting sites are business people like you too. They also gather opinions and reviews to keep their business growing. The best web hosting that don’t just rely on cheap prices are often the ones with a lot of loyal clients and positive reviews. After weeks of research, you might realize how easy it is for people to provide negative reviews to a web host which can make you think twice if you are making a good investment. Well, business is business. Without those bad reviews, the deal will only seem like it is so good to be true. To get through, you can study these bad reviews and understand if they are subjective or objective. Compare it to the positive reviews and apply your standards to help you generate a final decision as well. · Server Location - It is ideal to have your server located near you for search engines to easily verify your site. This also affects how quickly your site can load. So instead of just joining the bandwagon by investing on a web host that’s countries away from your location, you can opt to the ones that can help your site load quickly, plus it helps you access them. · Friendly and Consistently Responsive Support – Without them you’re simply working with a robot. And even if technology has evolved in a way that we can get answers through these bots, search engines for example, it is still better to have humanized support from a web hosting. These people are usually the nicest at first but can immediately change once a deal has been made. Note that you will need support a lot especially when you’re terribly conscious why your site is down for the last minutes. Their friendly support team now must remain the same in the future. This is also for you to not jump from one web host to another. Securing a web hosting that can stand the test of time is better. To get the best of both, you also need to work on the foundation of your site. And when we say foundation, it’s not just one thing, it is a lot of things combined. There’s web design, there’s search engine optimization, there’s social media marketing, there’s content writing, there’s link building, and on and on. These things may seem tiresome to do once you individually chase them without thinking which comes first. To easily get you on the right track, you need SEO knowledge, tools, and a team. Building a website for business is not meant to be done by one man, it’s meant for a lot of brains to collaborate, work on their specialties, and fix errors instead of halting in between. In finding a team that you can trust, or a specialist that can provide a reliable opinion for the type of site you’re running, consulting to one of our best search engine optimizers can be your first step. We acknowledge your competition’s movement in SEO to determine which steps can help you move up. How to Buy a Cheap Domain Name? Are you planning to set up your personal website? Then, the foremost thing that you need to do is to buy a domain name. Having a domain name would help you to personalize email addresses and also have the best website for your company or personal use. When it comes to buying domain names, you need to keep in mind to look for the cheapest one. You will be able to buy an available domain name or do haggling for an already occupied one. One word names and short words used for domain names would be costly. Simple titles have a lot of potentials to attract visitors. If you are planning to get an already registered domain for your website, you need to contact the current owner. Registered domains are costly even when there are misspellings or multiple words. Abstain from choosing bizarre names that would diminish domain performance. There is a scarcity of domains in .com, so you can shift to other domains that are available like .club, .guru, and .design. Before you work full-fledged with the domain you buy, you should create a few variants and backups. 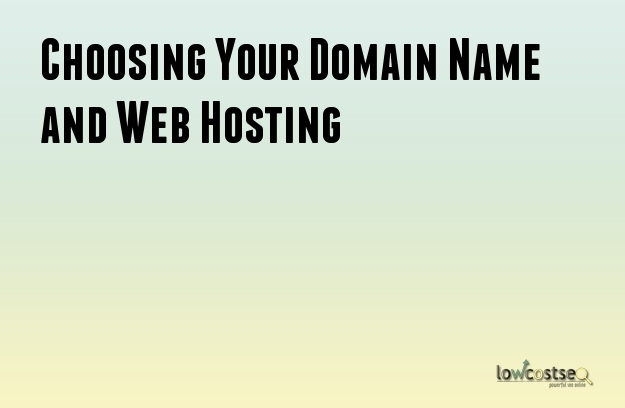 You should also avoid adding special characters in your name while creating a domain name. These are not intuitive and will divert traffic. You also need to consider whether the company you are buying the domain from is an ICANN accredited domain name registrar. Remember, there are many domain registrars who do not let you make changes and personalization to the domain you buy. You need to enter a request to make changes to the support systems and then, wait for assistance. There are various things like changing the IPS tags and the name servers should be possible via the control panel. When buying domains, you need to check that you are getting a control panel for your website. You need to check what the control panel lets you do. When you are buying domain name, there is another thing that you need to check – if there is a fee associate with the transfer or release of your domain later. There are many domain registration and hosting companies that charges a certain fee for changing host. You should always look for a company that does not charge for any such things. You should never be asked to ransom over your domain name. While buying never forget to check whether you get any email accounts along. There are many companies that do not include email or charge something extra for it. You should choose a company that provides several POP3 email accounts free of charge with your domain that you purchase.